Accommodation, welcome drink, breakfast, housekeeping, bicycles, parking, and Wi-Fi. $23/night per child 7-12 years old and $35/night per person 13 years and older in an extra bed. Child under 4 years old in a crib or child 4-6 years old in an extra bed stay free of charge. Max. 1 bed/crib per room. All canceled reservations received 30 or more days prior to arrival are subject to a 10% cancellation penalty. Reservations canceled within 29 days of the scheduled arrival date are subject to a 100% penalty and are responsible for the entire stay and will forfeit all payments. Shuttle service to / fro Dolo station is available on request at an additional cost. Canonici Di San Marco is an exclusive resort, an oasis of peace for a unique experience of nature and culture, in an exclusive environment where attention to details creates the pleasant sensation that makes the traveller feel at home. Glamping at this property offers hospitality in luxurious tents placed in the park of a seventeenth century barn immersed in the quiet of the country side that extends between the Venetian lagoon and the Brenta river, where the Doges and the ancient and Noble Venetian families had their summer homes. Canonici Di San Marco is located in Mirano, only 13 km from Venice, immersed in the peaceful countryside that extends between the Laguna and the River Brenta where ancient, noble Venetian families had their summer residences. These uniquely Italian glamping lodges are furnished in a luxurious, refined yet unconventional style. 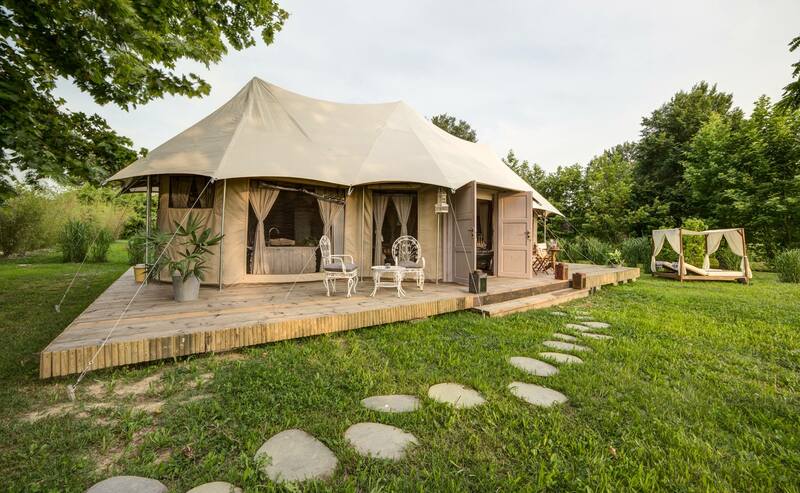 In the charming rural landscape that surrounds it, made of native trees and olive orchards, the glamping experience at Canonici Di San Marco allows you to surround yourself in nature without giving up comfort. An ideal base for visiting nearby cities like Venice, Treviso, Padua and Verona or beach resorts such as the famous Venice Lido, Jesolo, Caorle, Sottomarina which will be your refuge. For a cultural stay, wine tasting, gastronomy, sports and social, allows you to find back from your excursions that secret harmony that only contact with nature can generate . Each glamping lodge sleeps from two to five guests. There is a spacious bedroom (with beds that can be arranged according to requirements) and a lounge area. The spacious bathroom, which is equipped with a shower and ceramic fittings, is separated by a heavy curtain and has a panoramic view over the surrounding fields. Nightly rates include the following: welcome drink, hearty breakfast with homemade sweets, drinks and snacks from the mini fridge, bicycle use, daily and final cleaning, taxes, and wireless Internet access.